The Maine eviction notice forms are to be used in the event that a landlord in Maine seeks to evict a tenant (called Forcible Entry and Detainer) for failure to pay rent or for some other breach of a lease. The 30-Day Notice to Quit (Month to Month) is used to give notice to the tenant that the landlord does not intend to renew a month-to-month tenancy. Landlord must provide the written notice by handing the notice to the tenant in person. If after three tries, landlord is unable to deliver the notice, he or she may mail the form. The landlord should have evidence of delivery of the notice for the court.If the tenant fails to respond within the requisite time frame, the landlord may go to the District Court representing the area in which the property is located and file a Complaint (Form CV-007) with a Summons (Form CV-034) which must be obtained from the Clerk’s Office. If the landlord prevails, and tenant still fails to vacate, the landlord may obtain a Writ of Possession (CV-195) from the court and procure the assistance of the sheriff to have the tenant removed. State Instructions (Form CV-100) – View the official instructions provided by the State of Maine on their eviction process. 7-Day Notice to Quit (Non-Payment) – The landlord may use this form of notice to let the tenant know they must pay the full amount of rent within seven days or face eviction proceedings. 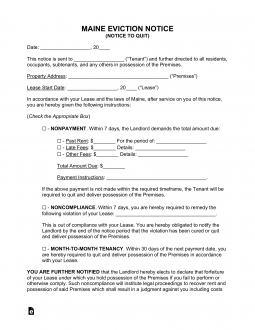 7-Day Notice to Quit (Non-Compliance) – The landlord may use this form to let the tenant know they must cease the breach of the lease terms (other than non-payment of rent) within seven days or face eviction proceedings. 30-Day Notice to Quit (Month to Month) – This form is for use when a landlord seeks to end a month-to-month tenancy. In Maine, rent is considered late if it is not paid on the date specified in the lease. A landlord may not start charging a late fee, however, until the rent is fifteen days late. A landlord also must also give seven days notice to tenant before beginning eviction proceedings. Step 2 – If the tenant does not respond to the notice to quit, the landlord then may commence a forcible entry and detainer action by filing the Complaint (Form CV-007) and Summons (Form CV-034) which must be obtained from the Clerk’s Office ($5 fee) and must pay a filing fee of $75. Step 3 – The landlord must then take a copy of the Summons and Complaint to the sheriff for service on the tenant. The landlord must provide evidence of service, either from the sheriff, or if the sheriff is unable to serve, then landlord must mail the summons and complaint and file an Affidavit of Service (Form CV-204) with the court. The tenant will have to receive the summons at least seven (7) days before the date of the hearing. Step 4 – If the tenant fails to appear at the hearing, the court will issue a default judgment and tenant will have to vacate immediately. If the tenant still fails to vacate, the landlord may obtain a Writ of Possession (Form CV-195) from the court and have the sheriff remove the tenant. All the information required on this form will be located in your records. Normally, all you will need is a valid copy of the Lease and the Maine Notice to Quit (downloadable using the “PDF,” “ODT,” and “Word” buttons). This document will begin requiring three pieces of information: Recipient’s Name, Rental Property Location, and Lease Signature Date. The introduction of this document begins with the word “To.” Report the Name of the Recipient following this word. The first statement with blank spaces will require the name of the City and County of the Rented Property to be entered in the appropriate areas. There will also be a blank line to report the Zip Code of the Rented Property. The last two spaces will call for the Building Number/Street and Apartment Number of the Rented Property. The following statement will contain the phrase “…lease agreement signed on…” Fill in the Calendar Day, Month, and Year the Lease reports as the Signature Date on the first, second, and third blank lines. This area of the document will provide the Notification Statement you wish delivered to the Recipient by virtue of this document. If you are simply providing a Date to end a Month to Month Tenancy, skip to the next section which addresses the last two checkboxes. If you are addressing a Delinquent Tenant, then choose one of the following statements by marking the appropriate checkbox. Select “Nonpayment” if this document must inform a Tenant that he or she will have seven days to remit payment for a Rental Payment that is presently unpaid and overdue or relinquish the Rented Property to the Landlord. This statement will require some information to be entered. The first will be the Name of an Agent authorized to accept the overdue payment in the absence of the undersigned. Next, report the Total Amount the Tenant owes. Finally, locate the bold statement then, report the Dollar Amount and Rental Period the Recipient must pay. Here, the Tenant will be given Seven Days to remit the Overdue Rent or release possession of the Leased Property to the Landlord. Select “Noncompliant” if this document must inform a Tenant that he or she is in violation of the Lease and is being given Seven Days to effect compliance or return possession of the Rented Property to the Landlord. Enter the actions that are in violation of the Lease terms on the blank line. If this document’s purpose is strictly to terminate a Month To Month Lease Agreement, then select one of the following statements. Select the first Month To Month Tenancy statement if you are a Landlord informing a Tenant of the Termination Date to a Month to Month Tenancy, then report the Date of Termination on the blank spaces provided. Note: Thirty Days’ Notice is required. Select the second Month to Month Tenancy statement if you are a Tenant providing a Landlord a minimum of Thirty Days’ Notice to the Termination Date of the Month to Month Tenancy. You must report this Date on the spaces provided in this statement. The Owner or Landlord issuing this Notice must provide his or her Signature on the blank line beneath the Notification Paragraph. The party responsible for delivering this notification must enter the Date of Delivery and the Recipient Name near the bottom of this page. Next, the Agent of Delivery must select one of the checkboxes to demonstrate how this paperwork was Delivered. Delivery to the Intended Recipient or a reliable second party of age (i.e. co-worker or family member) will be indicated by the first or second checkbox (respectively). If the Agent is unsuccessful at a hand delivery, the paperwork will be sent by First Class Mail and the third checkbox must be checked. This form must be Signed by the individual delivering it to the Recipient.